New Brunswick is one of Canada's maritime provinces, on the Atlantic coast. It is also Canada's only constitutionally bilingual province. The majority of the population are Anglophone, however, the province does feature a very large Francophone minority, at 33%. The French where the first to settle in the area, in the mid 1500's, and over the next 150, settlers slowly moved into the area, and began to build lives across the whole area. The French designated the whole colony from what is now Nova Scotia to New Brunswick and beyond as Acadia. The 1713 Treaty of Utrecht saw France ceding the peninsula area of what is now Nova Scotia to Britain, leaving the rump Acadia under-populated, and poorly defended. France finally lost control over the whole of Acadia by the end of 1764, with the end of the French and Indian war. Following the 7 Year War, the territory that is now New Brunswick was absorbed into Nova Scotia. However, following the Revolutionary War, many loyalists fled the fledgling USA, and moved into Nova Scotia. These new arrivals felt like they deserved preferential treatment given their sacrifices for the Empire. This, not surprisingly, upset a lot of the established settlers, and ended up with Nova Scotia being partitioned, and New Brunswick being born. With the American Civil War raging, and growing Fenian activities along the border, it prompted New Brunswick to be one of the first four provinces to unite, and form the Canadian Confederation in 1867. 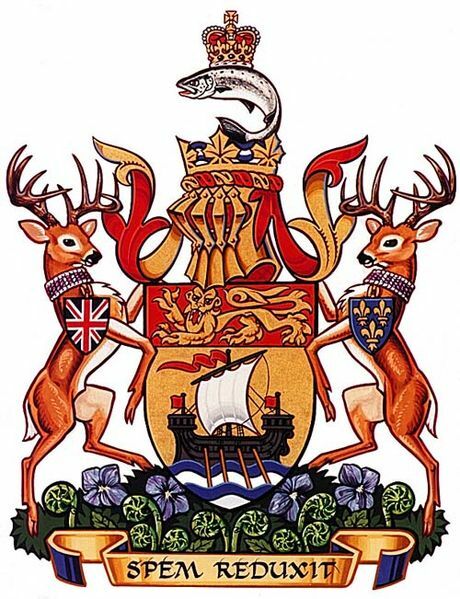 The Provinces coat of arms was instituted 1 year later, in 1868. The crest features a leaping Atlantic Salmon, topped with the crown of St Edwards Crown, and sits atop a golden crown of maple leaves. The shield features a lion passant, taken from the arms of England (which has 3) and the arms of Brunswick (which has 2). Underneath is an ancient representation of a Spanish galleon, which represents the provinces major industry at the time of formation, shipbuilding. The supporters are white-tailed deer. Both bear badges. One is the Union Jack, and the other is the fleur de lis. These represent the colonization of the area by Britain and France. 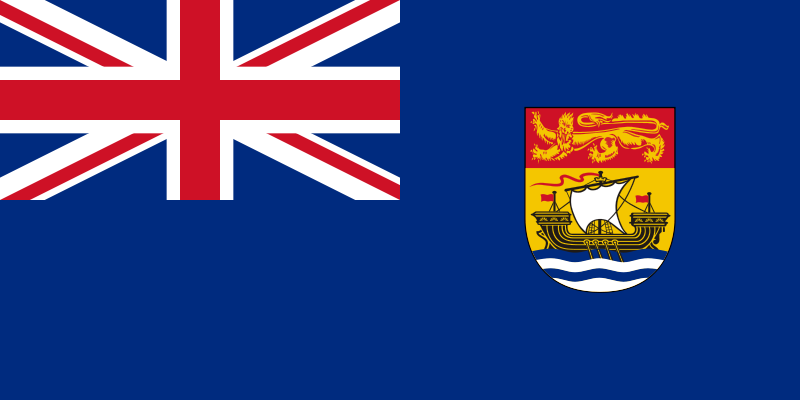 Initially, the province did not have an official flag, but the arms where used on flags used by the premier of the province, and other officials. 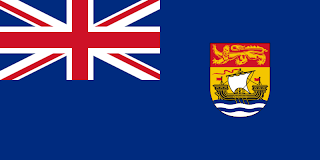 The shield was placed on a blue ensign, like many others in use in Canada. At first, the shield was slightly smaller, and sailing in the opposite direction to the way it is today. Later, the shield was revised, and the flag was essentially in use up until the introduction of the provinces official flag. 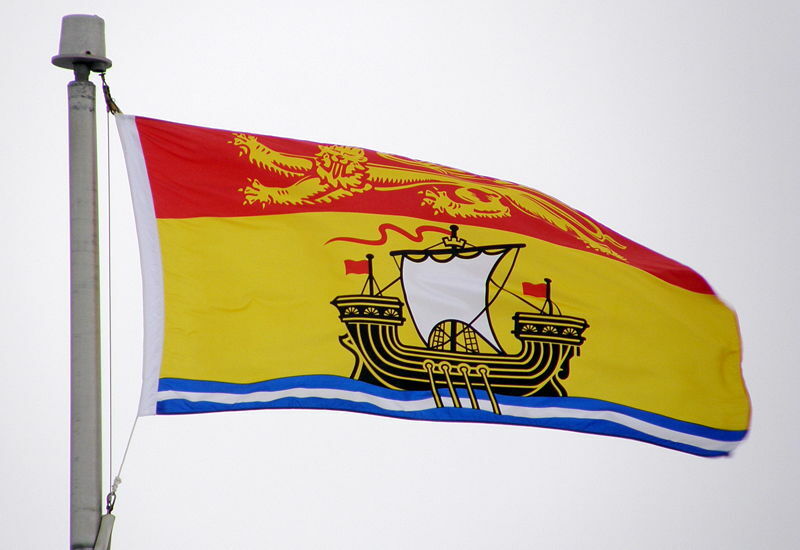 The flag of New Brunswick takes the main shield of the coat of arms, and stretches it out to form a flag for the Province. The flag itself was adopted finally in 1965.